Place the baguette pieces in a medium mixing bowl and use your hand to toss while slowly pouring in the turmeric water, to lightly stain all the bread. Set aside. Heat 200 ml of the olive oil in a large sauté pan over medium heat. Cook the mackerel pieces, in 2 batches, for 1–2 minutes, or until slightly curled and cooked through. Use a slotted spoon to transfer to paper towel. Lightly season with salt and black pepper and set aside. Cook the baguette pieces in the hot oil, stirring, for 3–4 minutes, or until crunchy and golden-brown. Use a slotted spoon to transfer to the paper towel with the fish. Don’t discard the remaining oil. 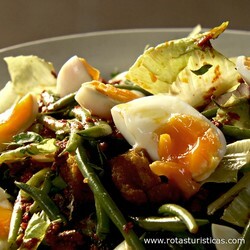 In a large mixing bowl, combine the lettuce, red onion, capsicum, olives and beans. Add the fish, croutons, remaining olive oil and a healthy grind of black pepper. Toss gently and then transfer to a large shallow serving bowl. Whisk the harissa, lemon juice and 3 tsp of the cooking oil in a small bowl. Spoon this over the salad, scatter over the parsley and finally top with the egg. 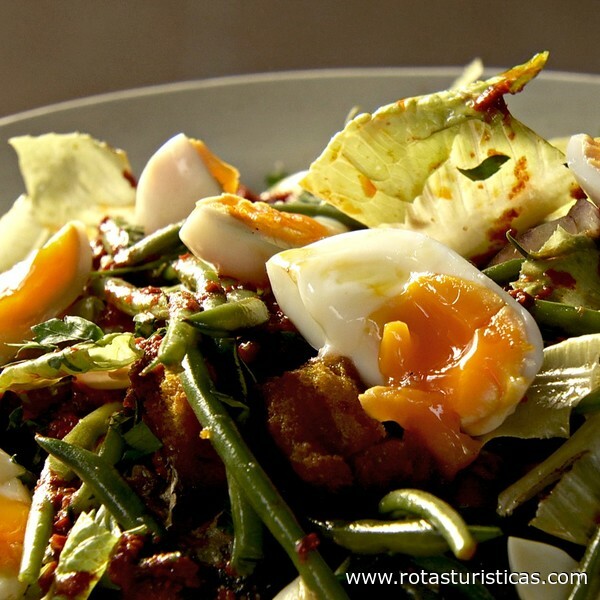 Finish the salad with salt and pepper and drizzle with the extra olive oil.